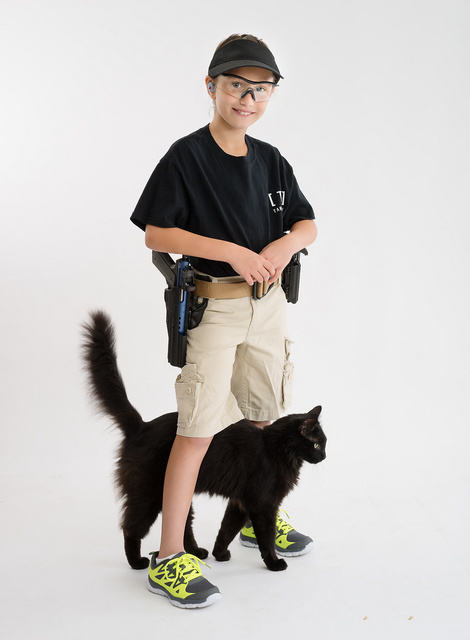 This entry was posted in interesting people, pet, pistol and tagged 22LR, black, cat, child. Bookmark the permalink. She’s wearing Tandemkross holster and mag carriers, too. I’ll have more detailed photos of those soon. I think of that belt as a skydiver’s belt (because the buckle is parachute hardware), but she seems a bit young to be a skydiver. I think that might be a pocket panther, cut down and sized for EDC of intrepid explorers. Gremlin is also a fluffier version of our ballistic monster-kitty Isha. Great photo! And compliments to Alex.